322 pages | 59 Color Illus. The first decades of the twenty-first century have offered a remarkable shift in how policies are made as well as who designs them. Until this period, local, regional, and national policy advisors largely comprised economists, lawyers, and financial experts. But in an era when behavioral scientists are increasingly being asked to demonstrate the impact of their research, many are playing a much greater role in policy making across a range of sectors as a result. 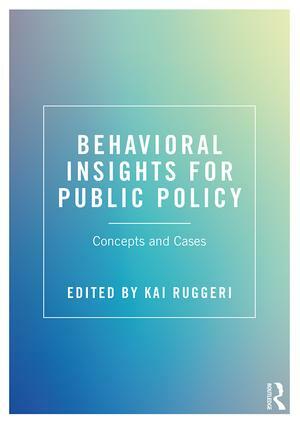 Written by a team of authors working across both academia and government, Behavioral Insights for Public Policy is the first textbook to fully examine how psychology can be applied to a range of public policy areas. It addresses a wide variety of topics from the origins of policy as well as major findings from behavioral economics and nudge theory, to large-scale applications of behavioral insights. The compilation is the first of its kind to broadly cover the underlying theory, history, major empirical examples, and practical applications to policy of nudges (or behavioral insights) for teaching and study in higher education. Featuring over 100 empirical examples of how behavioral insights are being used to address some of the most critical challenges faced globally, the book also includes a unique chapter from an organization actively implementing behavioral insights in policies along with various government institutions. Also featuring case studies looking at key policy issues, learning outcomes, a glossary of key terms, and an accompanying website, this important book will be essential reading for any student of applied psychology. It has also been produced for others interested in the topic from social, political, and economic sciences, as well as those in government looking for an overview of the key issues. Chapter 12 What is impact? Kai Ruggeri is the founding director of the Policy Research Group in the Department of Psychology at the University of Cambridge, UK, and Assistant Professor in Health Policy and Management at the Mailman School of Public Health, Columbia University, US. He holds a BA and PhD in psychology, and has a global portfolio of teaching and research in behavior, economics, and policy. He is a Fellow of Corpus Christi College and of the Royal Society of Arts.